Every Friday I paint a mermaid, and this is this week's! A new set of 12 mermaid postcards is also available! Those are some big snail shells! I love this one. I love her hair and freckles! Absolutely gorgeous! Love the subtle and sophisticated use of color. 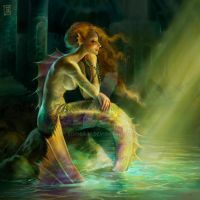 All your mermaids are lovely, but this one is particularly special! Thanks! And nice to hear from you again!! Thank you! Hope to be around a bit more this year.